This is a black and white portrait of the Mascioli family. 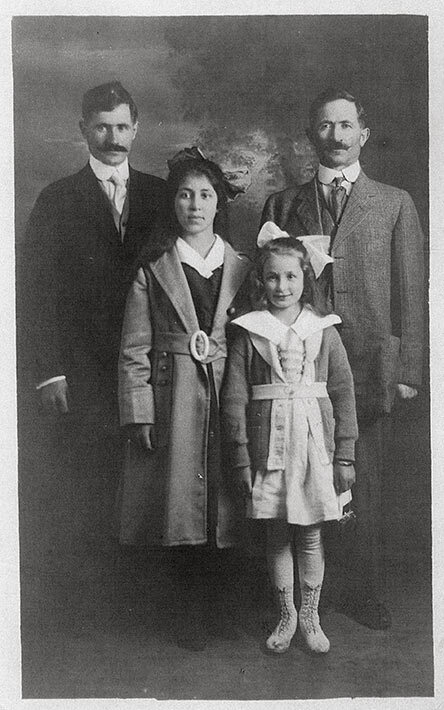 Shown left to right is Antonio (Tony) Mascioli, Loretta Mascioli, Maria Mascioli, and Leopoldo (Tony) Mascioli. Tony is wearing a black suit over a white shirt, a vest, and a tie. Leo is wearing a lighter coloured suit, also with a shirt, a vest, and a tie. Both men have large moustaches. Loretta is wearing a knee-length coat over a dark coloured outfit, possibly a dress with a white collar. Her coat has large buttons and has a belt. Maria is wearing a white dress underneath a belted sweater. She has white tights, white lace-up boots, and a big white bow in her hair. Everyone is staring straight at the camera but only Maria is smiling. Loretta and Maria are the daughters of Leo; Tony is Leo's brother. Leopoldo (Leo) Mascioli and Antonio (Tony) Mascioli, both of Timmins, were interned during World War II at Camp Petawawa.